Oklahoma State and Iowa put a cap on the 2018-19 dual season in front of 13,000-plus last Sunday afternoon in Stillwater. It was not the only dual, but it certainly provided the loudest results. Nick Piccininni’s pin of 2018 NCAA champion Spencer Lee shakes up the 125-pound rankings, but there is little change at the top as nine weight classes have an unbeaten man leading the pack — Northwestern’s Sebastian Rivera does have a loss, but it came to Michigan’s Stevan Micic at 133 pounds. Penn State still dominates the power rankings with Jason Nolf, Vincenzo Joseph, Mark Hall, and Bo Nickal all ranked No. 1. 1 – Sebastian RIVERA (Northwestern, SO) … Only loss came up at 133 pounds. 2 – Nick PICCININNI (Oklahoma State, JR) … Stunning pin of Lee on Sunday. 3 – Spencer LEE (Iowa, SO) … Expect him to bounce back at Big Tens. 4 – Ronnie BRESSER (Oregon State, SR) … Big-time under the radar entering March. 5 – Jack MUELLER (Virginia, JR) … Unbeaten and capable of winning it. 6 – Sean RUSSELL (Minnesota, SR) … Veteran is another contender. 7 – Brent FLEETWOOD (North Dakota State, SR) … Went overtime in Norman. 8 – Vitali ARUJAU (Cornell, FR) … Learn his name, now. 9 – Patrick GLORY (Princeton, FR) … Very dangerous early-round opponent. 10 – Rayvon FOLEY (Michigan State, SO) … Suffered his third loss in 32 starts last time out. 11 – Sean FAUSZ (North Carolina State, SR) … Nobody wants to see him in the second round. 12 – Drew MATTIN (Michigan, SO) … A good Big Ten schedule will have him ready. 1 – Stevan MICIC (Michigan, JR) … Can he win the nation’s deepest weight class? 2 – Daton FIX (Oklahoma State, FR) … He shut down DeSanto in Stillwater. 3 – Austin DeSANTO (Iowa, SO) … No fireworks against OSU, just a 2-0 loss. 4 – Nick SURIANO (Rutgers, JR) … A win at Big Tens changes everything. 5 – Ethan LIZAK (Minnesota, SR) … Former NCAA finalist will factor into top eight. 6 – Micky PHILLIPPI (Pittsburgh, SO) … He's the only man to beat Fix. 7 – Roman BRAVO-YOUNG (Penn State, FR) … Could move up at Big Tens. 8 – John ERNESTE (Missouri, SR) … Showed Gomez he’s ready for top eight. 9 – Luke PLETCHER (Ohio State, JR) … Has to finish high for Buckeyes to challenge. 10 – Austin GOMEZ (Iowa State, FR) … Strange result against Erneste. 11 – Chaz TUCKER (Cornell, JR) … Gaining momentum, just like Cornell. 12 – Tariq WILSON (North Carolina State, SO) … If healthy could cause some problems. 1 – Yianni DIAKOMIHALIS (Cornell, SO) … Closed out a perfect regular season. 2 – Josh ALBER (Northern Iowa, SR) … Big 12s will show if Alber is a contender. 3 – Jaydin EIERMAN (Missouri, JR) … Five straight pins to finish regular season. 5 – Nick LEE (Penn State, SO) … The sophomore has won 24 of 25. 6 – Joey McKENNA (Ohio State, SR) … Just one loss this season for the senior. 7 – Kanen STORR (Michigan, SO) … Part of a strong Wolverine lineup. 8 – Mitch McKEE (Minnesota, JR) … He's expecting a medal this season. 9 – Ian PARKER (Iowa State, SO) … Has suffered three straight losses. 10 – Kaid BROCK (Oklahoma State, JR) … A dangerous early-round opponent. 11 – Matt FINDLAY (Utah Valley, SO) … Way under the radar. 12 – Jamel MORRIS (North Carolina State, SR) … Seven straight victories. 1 – Anthony ASHNAULT (Rutgers, SR) … Could he be Rutgers’ first NCAA champ? 2 – Micah JORDAN (Ohio State, SR) … Only loss this season is to Ashnault. 3 – Mitch FINESILVER (Duke, SR) … Nice win over O’Connor last weekend. 4 – Matthew KOLODZIK (Princeton, JR) … Lost to Drexel’s Kropman. 5 – Austin O’CONNOR (North Carolina, FR) … Approaching 30 wins. 6 – Christian MONSERRAT (West Virginia, SR) … Top seed at Big 12s? 7 – Justin OLIVER (North Carolina State, SR) … Could easily be on the big stage in Pittsburgh. 8 – Anthony ARTALONA (Penn, FR) … Will have some support in Pittsburgh. 9 – Jarret DEGEN (Iowa State, SO) … More good than bad for 2018 NCAA qualifier. 10 – Brock MAULLER (Missouri, FR) … Hammered Gfeller; lost to Degen a week later. 11 – Pat LUGO (Iowa, JR) … Slow start, but rolling now. 12 – Kaden GFELLER (Oklahoma State, FR) … Couple of tough weeks for the rookie. 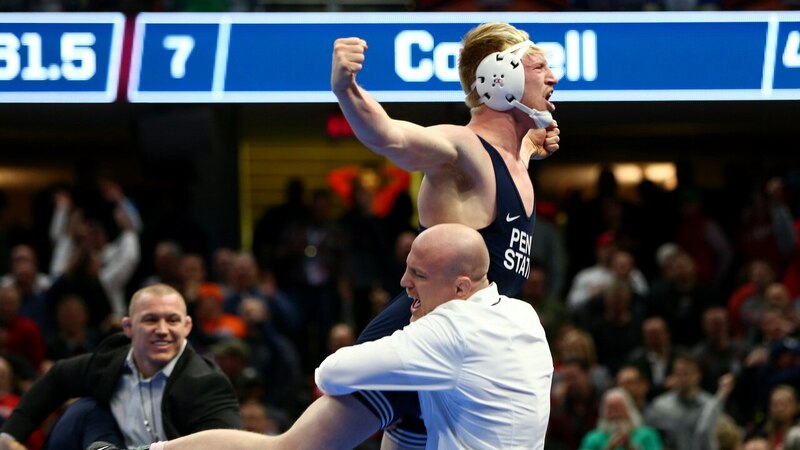 1 – Jason NOLF (Penn State, SR) … Don’t make this guy mad. 2 – Tyler BERGER (Nebraska, SR) … Could get a shot at Nolf at Big Tens. 3 – Ryan DEAKIN (Northwestern SO) … See Berger. 4 – Hayden HIDLAY (North Carolina State, SO) … Remember, he was a finalist as a rookie in 2018. 5 – Alec PANTALEO (Michigan, SR) … Could move up with a good Big Ten tournament. 6 – Kaleb YOUNG (Iowa, SO) … A really good 5-seed at Big Tens? 7 – Steve BLEISE (Minnesota, SR) … Had a really solid senior campaign. 8 – Ke-Shawn HAYES (Ohio State, JR) … NCAAs won’t be as tough as conference bracket. 9 – Larry EARLY (Old Dominion, JR) … Can he finish the season like he started it? 10 – Zach HARTMAN (Bucknell, FR) … Could he crash the Big Ten party in Pittsburgh? 11 – Taleb RAHMANI (Pittsburgh, JR) … Up and down season. 12 – Christian PAGDILAO (Arizona State, SR) … Has a good chance at top eight. 1 – Vincenzo JOSEPH (Penn State, JR) … Another unbeaten Nittany Lion. 2 – Alex MARINELLI (Iowa, SO) … Do not bet against this bull. 3 – Evan WICK (Wisconsin, SO) … Should see Marinelli, maybe Joseph at Big Tens. 4 – Josh SHIELDS (Arizona State, JR) … Going home to Pennsylvania for nationals. 5 – Chance MARSTELLER (Lock Haven, SR) … Will be a tough out in March. 6 – Isaiah WHITE (Nebraska, JR) … Been awhile since a DII champ won DI also. 7 – Mekhi LEWIS (Virginia Tech, FR) … Freestyle or folkstyle, can score takedowns. 8 – Branson ASHWORTH (Wyoming, SR) … Big 12’s top seed. 9 – Demetrius ROMERO (Utah Valley, JR) … Another Wolverine flying under the radar. 10 – Logan MASSA (Michigan, JR) … Will not bow out quietly in Pittsburgh. 11 – Chandler ROGERS (Oklahoma State, SR) … Iowa dual showed what he can do. 12 – Bryce STEIERT (Northern Iowa, JR) … Another steady Panther. 1 – Mark HALL (Penn State, JR) … Has not lost since 2018 NCAA final. 2 – Myles AMINE (Michigan, JR) … Had a one-point loss to Hall. 3 – Daniel LEWIS (Missouri, SR) … Too good not to take seriously. 4 – Zahid VALENCIA (Arizona State, JR) … Can a returning champ be under the radar? 5 – Jordan KUTLER (Lehigh, JR) … A strong second semester. 6 – Joe SMITH (Oklahoma State, JR) … Most likely at 165 for the postseason. 7 – David McFADDEN (Virginia Tech, JR) … A dangerous quarterfinal opponent. 8 – Mike LABRIOLA (Nebraska, FR) … A great schedule has him, Huskers, prepared. 9 – Taylor LUJAN (Northern Iowa, JR) … Might be top seed at Big 12s. 10 – Matt FINESILVER (Duke, JR) … Odds are good a Finesilver finishes top eight. 11 – Neal RICHARDS (Virginia Military Institute, JR) … Last loss was in November. 12 – Dylan LYDY (Purdue, JR) … Six straight wins. 1 – Myles MARTIN (Ohio State, SR) … A dominant season so far. 2 – Shakur RASHEED (Penn State, SR) … The key to PSU’s title hopes? 3 – Ryan PREISCH (Lehigh, SR) … Another Mountain Hawk in the finals? 4 – Louie DePREZ (Binghamton, FR) … 25 wins for the freshman. 5 – Emery PARKER (Illinois, SR) … Only two losses this season. 6 – Zack ZAVATSKY (Virginia Tech, SR) … Drops after loss to Cornell’s Dean. 7 – Nick REENAN (North Carolina State, SO) … Important part of Wolfpack's hopes. 8 – JACOBE SMITH (Oklahoma State, SR) … Been great here; prepare for him at 174. 9 – Cash WILCKE (Iowa, JR) … A good performance at Big Tens could move him up. 10 – Taylor VENZ (Nebraska, SO) … Not the guy you want in the second round. 11 – Max DEAN (Cornell, SO) … Majored Zavatsky. 12 – Sam COLBRAY (Iowa State, JR) … Picking up steam in February. 1 – Bo NICKAL (Penn State, SR) … Is he the biggest favorite to win in Pittsburgh? 2 – Kollin MOORE (Ohio State, JR) … A rematch with Nickal at Big Tens? Pittsburgh? 3 – Ben HONIS (Cornell, SR) … Whipped by Moore last time out. 4 – Willie MICKLUS (Iowa State, SR) … Will be an emotional NCAA championships for the senior. 5 – Preston WEIGEL (Oklahoma State, SR) … Looks healthy; took out Warner on Sunday. 6 – Patrick BRUCKI (Princeton, SO) … One loss in 26 starts. 7 – Jacob WARNER (Iowa, FR) … A lot of upperclassmen in front of him. 8 – Rocco CAYWOOD (Army, SR) … Black Knights’ best shot at top eight this year? 9 – Nathan TRAXLER (Stanford, SO) … The best of the west. 10 – Tom SLEIGH (Virginia Tech, SR) … Part of a logjam from spots 8-12. 11 – Jay AIELLO (Virginia, SO) … Seven straight victories. 12 – Josh HOKIT (Fresno State, JR) … Can he challenge Weigel, Micklus in Tulsa? 1 – Gable STEVESON (Minnesota, FR) … A rare undefeated freshman heavyweight. 2 – Derek WHITE (Oklahoma State, SR) … Saved the Cowboys at Missouri. 3 – Anthony CASSAR (Penn State, SR) … Only loss is to White at Scuffle. 4 – Jordan WOOD (Lehigh, SO) … Another possible finalist for Santoro. 5 – Amar DHESI (Oregon State, SR) … Eight wins since debut loss. 6 – Matt STENCIL (Central Michigan, SO) … Has not lost since Midlands. 7 – Sam STOLL (Iowa, SR) … Battled White until the end last Sunday. 8 – Trent HILLGER (Wisconsin, FR) … Big Ten always has good heavyweights. 9 – Mason PARRIS (Michigan, FR) … When was last time three rookies in top 10 at 285? 10 – Youssif HEMIDA (Maryland, SR) … Bright spot for Terps this season. 11 – Demetrius THOMAS (Pittsburgh, JR) … Could cause some problems at NCAAs. 12 – Thomas HAINES (Lock Haven, SR) … Will have plenty of support in Pittsburgh.